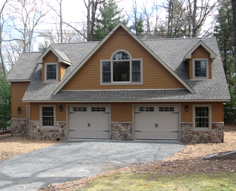 Don't overlook any aspect of your new home construction, and turn to the professionals in Paupack, Pennsylvania, at Homestead Design & Build, Inc. Here, we'll look at a few of the standard building points associated with creating custom homes. Have Homestead Design & Build Inc. create the inside of a home that will take your breath away. The flooring allowance is $22.00 per yard for carpet, $10.00 per foot for tile, and $7.75 per square foot for hardwood. We use strong ½" sheetrock taped and spackled three coats. We take this extra step to ensure everything is sealed and protected throughout your home. The process we undergo for our sheetrock includes two coats of flat wall paint (including all trim), one coat stain, and two coats of polyurethane. Trim to be 4” casing around windows and 6” baseboard with base cap. All closets are from premium ClosetMaid™ shelving. Contact us today to get started on building the perfect custom home for you.